One of the most expensive energy projects in Canada could soon get larger. Construction ramped up this month on LNG Canada's massive natural gas export facility in northern B.C., but the consortium is now talking about possible expansion. One of the most expensive energy projects in Canada could soon get larger. Construction ramped up this month on LNG Canada's massive natural gas export facility in northern B.C., but the consortium is now talking about possible expansion. LNG Canada is a consortium of companies led by Shell Canada and includes Petronas, PetroChina, KOGAS and Mitsubishi Corporation. The project includes a pipeline across B.C., a port and terminal that liquifies the gas so it can be transported on tankers. The potential price tag of the entire project has been estimated to be upwards of $40 billion. Chief executive Andy Calitz spoke confidently of how it's likely just a matter of time before the ownership group commits to an expansion of the Kitimat site. A decision on making the investment could happen before the initial five-year construction project is finished. "The five joint venturers now have probably two main considerations in their head as to when they go ahead with [the final investment decision] on the expansion trains," said Calitz, referring to the system of compressors that turn the natural gas into a liquid. "The first one is, what is the market doing? What is the market doing globally in terms of Korea, Japan and China, South Asia and India?" The other consideration is whether construction of the initial facility and pipeline are on schedule and on budget. The pipeline, which had faced a blockade from a group of Indigenous hereditary chiefs, is being built by a subsidiary of TransCanada. Calitz said construction is underway on the pipeline in the area where the blockade occurred. Calitz said he has no doubts the pipeline and export facility will be completed. "Right now, the focus of the team is to make sure that we give them that confidence [to move ahead]," said Calitz, commenting on efforts to keep the construction on schedule. Any talk of an expansion is positive for the beleaguered natural gas sector. It has suffered from poor commodity prices for much of the last decade. The additional spending by LNG Canada would also be noteworthy, considering the decline of investment in Western Canada's energy sector since the oil price crash in 2014. "I'm surprised they're talking about [the expansion], but I'm not surprised that they see the potential for it," said Kevin Birn, an analyst with IHS Markit. Birn pointed to the growing demand in Asia, the plethora of natural gas in Western Canada, and the relatively close geography of Canada and Asia as reasons the project likely makes financial sense. "They win in terms of scale," he said about the possible expansion. "And you have that resource potential that is so large there. It's not a question about whether they can supply that expansion." Calitz didn't want to speculate about the cost of the expansion. But he said there would be many cost savings compared to the initial facility, including the fact there would be no need to repeat the costly expense of site preparation. 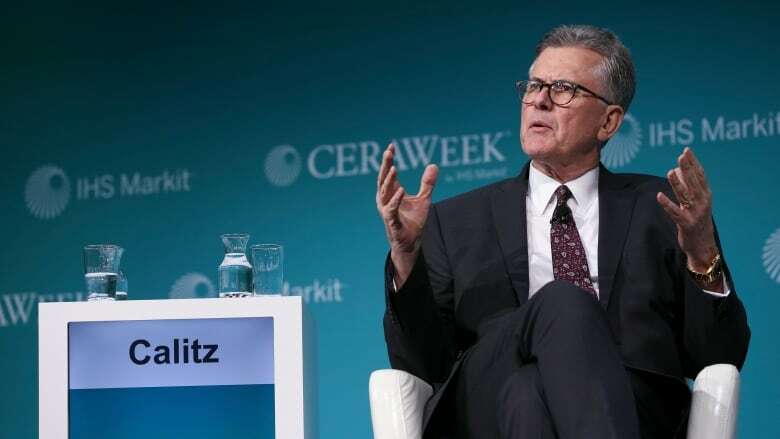 "The joint venturers see a very competitive export project for the second phase," said Calitz, who made the remarks to journalists in Houston at CERAWeek, an annual global energy forum. One outstanding issue for LNG Canada is the continued dispute over import tariffs for fabricated industrial steel within the Chinese modules used for the project. LNG Canada has argued it cannot afford to wait years to see whether Canadian manufacturers can construct the large LNG modules it needs. However, industry stakeholders such as the Canadian Institute of Steel Construction want Ottawa to maintain the border duties. LNG Canada has launched a judicial review of the import tariffs. The partner companies decided to go ahead with the project despite the outstanding issue and the potential costs associated with it. When asked if the dispute with Canada Border Services Agency has been resolved, Calitz took a long pause before answering, "Not fully." LNG facilities are comprised of a system of compressors known as trains. The LNG Canada facility under construction will have two trains, and Calitz said the expansion would be for an additional two trains. LNG Canada already has all the environmental permits for four trains, in addition to an export licence to operate all four trains for the next 40 years. "So, many things [are] very positively in place," he said.